I would say that I am a fairly patriotic person, and I love to decorate my home for the holidays. Several years back I never decorated my home for the 4th of July though. 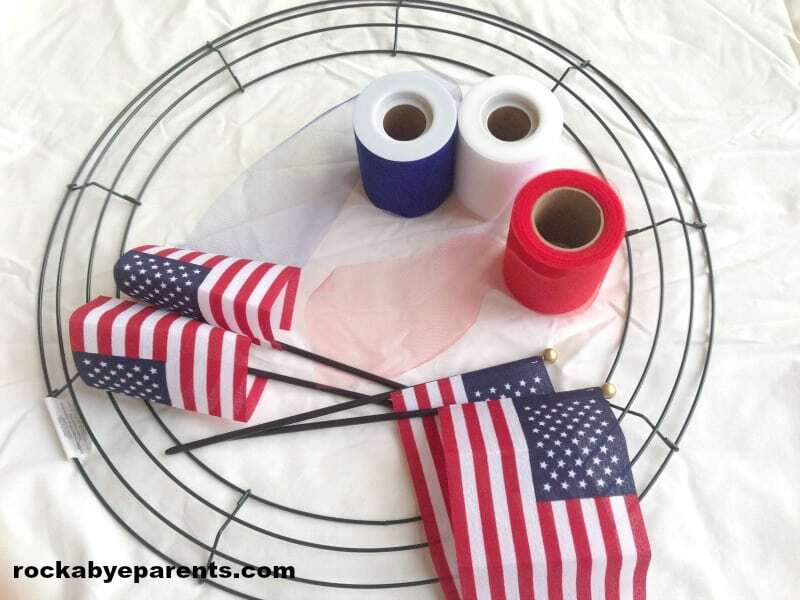 That was until I made this patriotic tulle wreath. I love hanging wreaths on my front door. 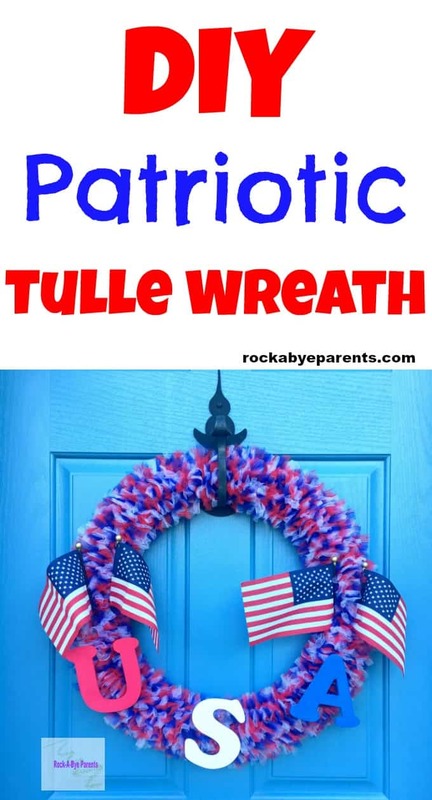 Creating my own patriotic wreath seemed like the best place to start for giving my home a patriotic feel. This was the first tulle wreath on a wire frame that I ever made. I really wasn’t sure what I was doing, but I did a little research for ideas and created my own fun technique and design. I love how the wreath turned out. The letters were something that I decided to add just before I had fully finished the wreath. The flags didn’t seem to be enough, and I was worried that they might not look quite right by themselves. The letters really helped the flags pop visually, and I think they give the wreath a more finished look. I have to admit that it took a lot longer to make the wreath than I had expected. It takes some time to cut up all of the tulle and to tie each piece on. It is a great mindless task though, so it was something that I could do while watching TV. While this wreath can take a bit of time to make, it is simple to do. There are actually many ways than you can go about this craft. I like to cut one round of tulle and then attach it as I go. 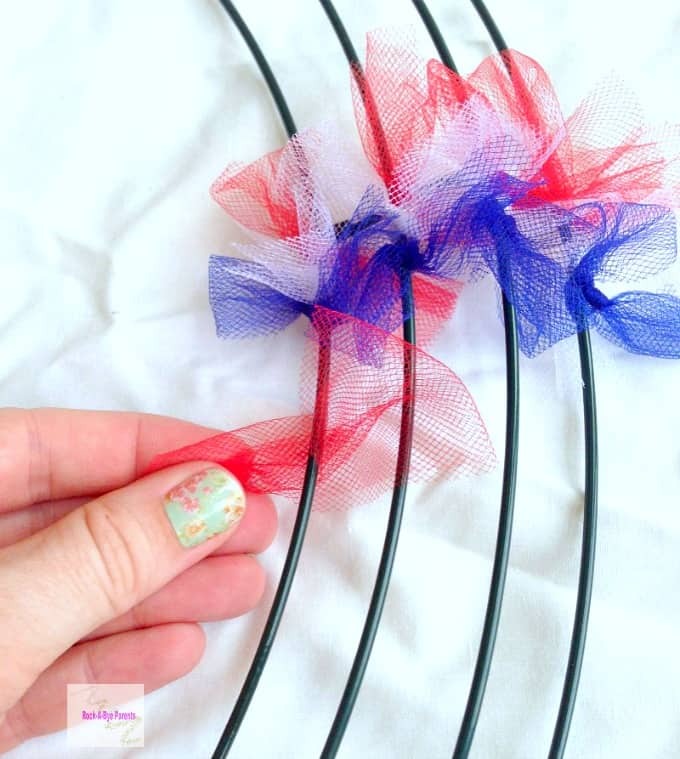 You may find it easier to cut a lot of tulle up before attaching any of it. Whatever is easiest and fastest for you is great. The first thing that I do is trim a length of tulle for my needs. If you can find 3 inch wide tulle then you can save yourself a step. Over the years I’m finding it harder to find that size in the colors that I need. Instead I buy it in a 6 inch width and cut it in half. You should be able to complete the wreath with only one spool of each color of tulle if you get a 6 inch width. If you get a 3 inch width you’ll need 2 spools of each color. You need to cut the tulle into 12 inch length pieces. I measure it with a ruler and cut at the 12 inch mark. You do not need the cut to be perfectly straight, so don’t worry about being precise. At this point, if you’re using a 6 inch width, you need to cut the tulle width in half to make it a 3 inch width. To do this fold the tulle up so that it is still a full 12 inches long. For those of you that know what I mean you need to do a hot dog fold. Then cut along the fold. Again you don’t need to be precise about the cut. Now you need to cut the length in half, so a hamburger fold. Again you’ll cut the tulle right along the fold. 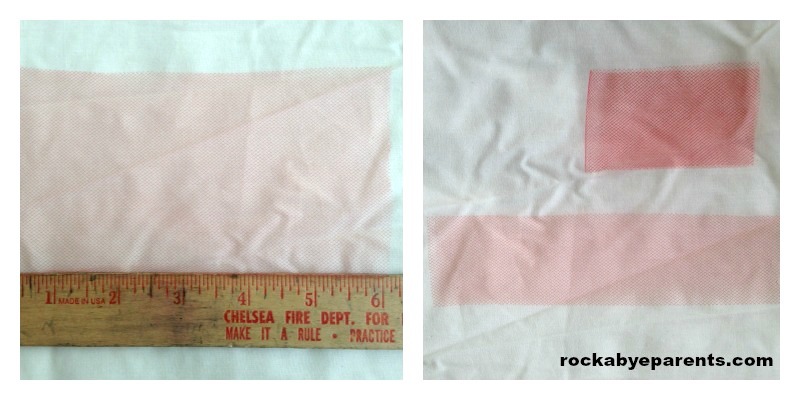 Then fold each tulle piece width wise one more time (another hot dog fold) and cut on the fold. When everything is done you’ll have tulle pieces that are 1.5×6. Now you could continue to cut a lot of tulle up and then come back to this step once you’re done cutting. If you’re like me you can now attach the pieces that you’ve just cut up. Attaching the tulle is pretty easy. First you need to fold a piece of your 1.5×6 tulle in half. Now you’re 1.5×6 piece should be a 1.5×3 piece. Once you have it that size you’ll put it under one of the wire rims of the wreath frame and tie the tulle in a single knot. The wreath frame that I chose had 4 different rings. I attached the tulle pieces in a straight line, so I did four of each color (1 piece for each wire ring). Then I changed to colors for the next row. I went in the order of red, white, and blue. It doesn’t really matter which color order you use as long as you keep the same pattern. Once you have finished attaching the tulle to the entire wreath it’s time to add the embellishments. 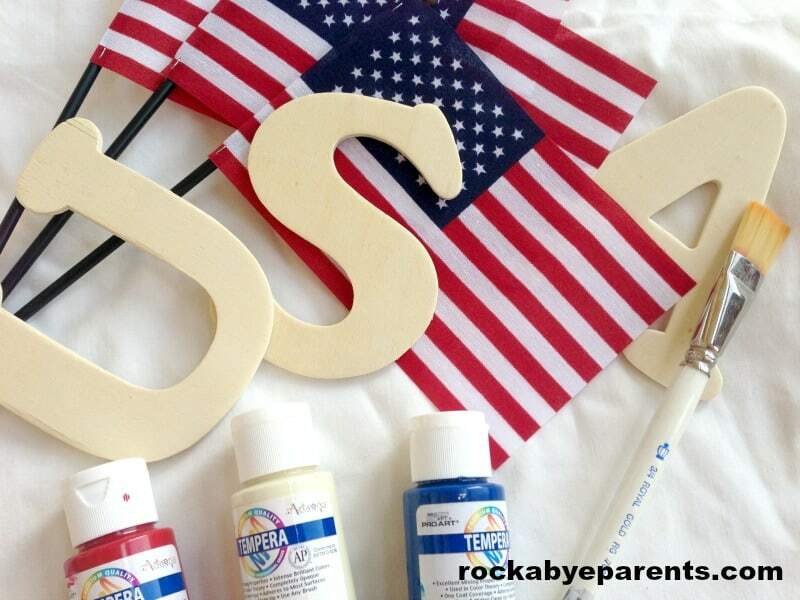 To start you’ll need to paint the wooden letters. I recommend taking the time to paint the top of the letters as well as the sides. Otherwise you’ll see wood unless you’re directly in front of the wreath. While the letters were drying I attached the flags. The flags are actually very easy to attach. All you need to do is stick them through the tulle. You may need to play around with it a bit to get them in the exact spot that you want. 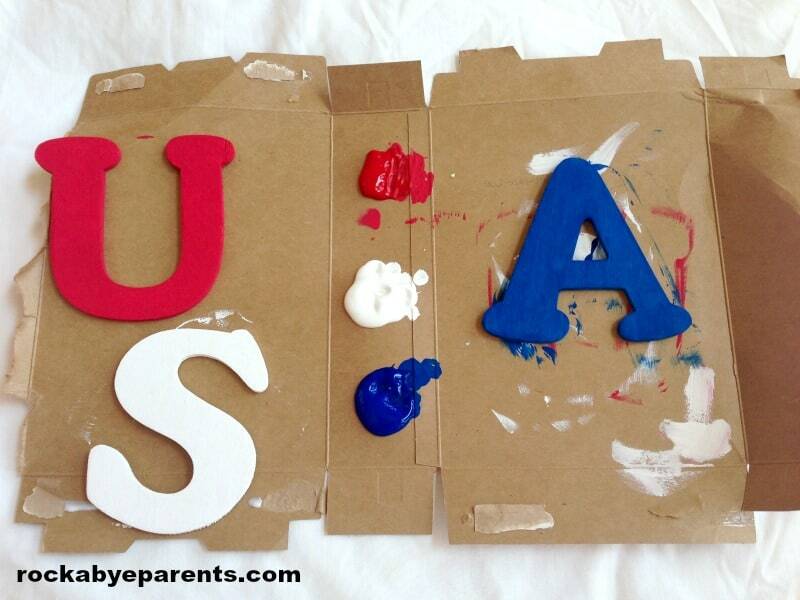 Once the painted the letters are dry you can finish the wreath by attaching the letters with hot glue. I would lay them down on the wreath and play with the spacing you would like before you attach any of the letters. Then just lift them up, add some hot glue, and put them right back where you had them. 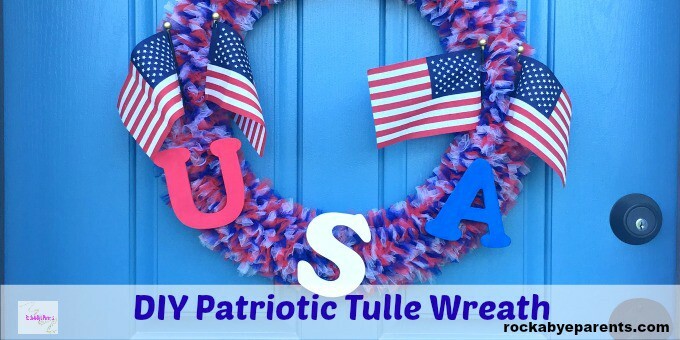 Once the glue is dry you’re patriotic tulle wreath is all done and you can proudly hang it on your front door. I usually put mine up before Memorial Day and leave it up until sometime after Labor Day. I like this wreath so much that I always hate to take it down. Now that you have your wonderful wreath do you need a way to hang it? Check out these different options from Amazon! Thanks for sharing this beautiful wreath. It was one of our 5 features today on Dare to Share Saturday. I am excited to share such a beautiful wreath and hope you’ll continue stopping by and sharing more great projects! That’s exactly the feelings I was going for Kim! It’s so nice to know that I was able to project my thoughts through my craft. Our country isn’t perfect, but I am always so proud to be an American. 🙂 Thank you so much for the feature on your linky party! This is beautiful! Thanks for sharing it at bloggers brags pinterest party. Pinned.